De Gouy was the Chef-de-Cuisine at the Waldorf-Astoria for thirty years. As such he was a classically trained cook. Enough qualifying this guy. His cookbook is an excellent starting point for any recipe or ingredient. On page 233 of my book, starts his Tips for cooking fish, which I reproduce here, for added posterity. DO dip the fish in salted milk, then in (saltine) crumbs or fine corn meal for deep frying fish. DO rub lemon juice over fish before broiling, baking or simmering it. This adds flavor, retains a fresh color and prevents the fish from falling apart as it cooks. DO dip your fingers in salt when cleaning fish. This makes the fish easier to handle. DO add a little vinegar (or lemon juice) to the water when simmering fish. This prevents the fish from separating. DO add a tablespoon of lemon juice, sherry wine, or tarragon vinegar, to the egg in which the fish is dipped before frying. DO shake a little salt into the heated oil that the fish will be pan fried in, and the fish will have a better flavor. DO thoroughly dry fish for frying crisp. Sprinkle both sides with plenty of (highly) seasoned flour and plunge into the boiling fat. DON'T leave fish, except salted cod or other salted fish, in water; it extracts flavor and makes the fish flabby. 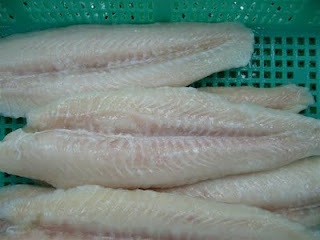 Here is a picture of some swai fillets. I like fish seasoned and cooked as simply as possible. I will sprinkle these fillets with a little salt and (commercial) Lemon Pepper. Then they will be fried for a total of 8 minutes (or maybe 7 minutes) in olive oil. A baked potato, sour cream, chives and a salad finish the plate.